MARS COMET WORKSHOP: On Oct. 19, 2014, Comet Siding Spring will pass so close to Mars that the atmosphere of the comet might interact with the atmosphere of the Red Planet. Today, researchers are gathering at the Johns Hopkins University Applied Physics Laboratory to discuss the encounter. The meeting will be streamed live starting at 8:45 AM EDT on Aug. 11th. Members of the public are welcome to listen and ask questions on Twitter using the hashtag #MarsComet. 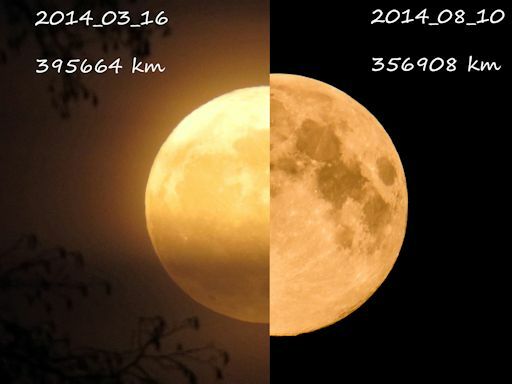 "I compared the normal full Moon of March 2014 with the Supermoon of Aug 2014," says Vauhkonen. "In individual images, the difference in size might be difficult to see, but putting them side by side makes the difference clear. I used the same photo settings for both images, so the scaling has no errors." Supermoons are possible because the Moon's orbit is not a circle, it is an ellipse. One side, perigee, is 50,000 km closer than the other, apogee. On August 10th the Moon became full just as it reached perigee, the point closest to Earth. This caused the Moon to appear authentically bigger and brighter than usual. PERSEID METEOR UPDATE The Perseid meteor shower is underway as Earth moves into the debris stream of parent comet Swift-Tuttle. According to the International Meteor Organization, the constellation Perseus is now spitting out meteors at a rate of about 20 per hour. In a normal year, those rates would increase 4- or 5-fold as the shower reaches its peak on August 12-13. But this is no normal year. In 2014, the glare of a supermoon will interfere with Perseid visibility, capping visible meteor rates at no more than ~30 per hour. As the movie shows, the meteor cut through the moonlight wih ease. In the past week, NASA's network of all-sky cameras has recorded nearly 100 Perseid fireballs over the USA, and more are in the offing. So, note to sky watchers: Don't be put off by the supermoon. A trip to the moonlit countryside on August 12-13 will be rewarded by a display of Perseids, albeit fewer than usual. A good time to look on those nights might be during the hours after sunset when the Moon is still hanging low in the sky and the constellation Perseus is rising in the northeast. Such an arrangement can produce a special type of meteor called an earthgrazer. Earthgrazers emerge from the horizon and skim the top of the atmosphere above the observer, a bit like a stone skipping across the surface of a pond. An hour's watching might net no more than one or two of this special kind of meteor, but that's plenty. Earthgrazers are colorful and gracefully slow, a rare beauty that makes any meteor-watch worthwhile. Got clouds? You can listen to the Perseids live on Space Weather Radio. 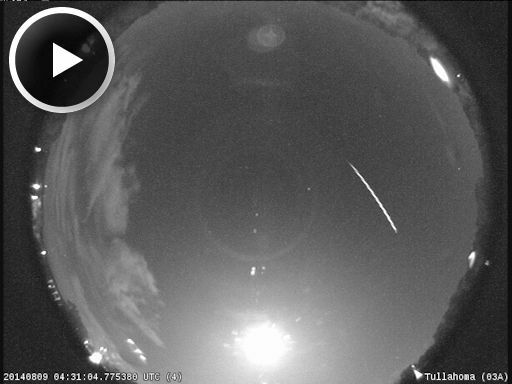 On Aug. 11, 2014, the network reported 9 fireballs. On August 11, 2014 there were potentially hazardous asteroids.